We’re just two years removed from the Philadelphia 76ers nearly knocking off the Boston Celtics for a shot at the Miami Heat in the 2012 Eastern Conference finals, and not a single player remains from that roster. Gone is every pick predating Michael Carter-Williams, and yet the Sixers’ brass is banking on a rebuilding strategy that will rely heavily upon new-ish general manager Sam Hinkie’s draft success. It’s not such a bad bet gambling on Hinkie, especially since he’s enjoyed a bit of good fortune the past two years. 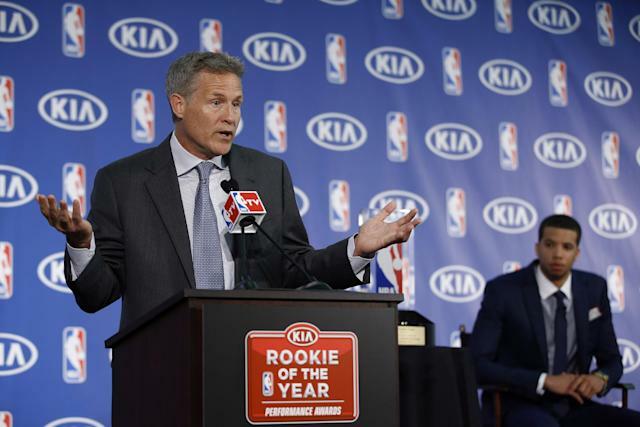 Houston Rockets general manager Daryl Morey’s former right-hand man landed last year’s Rookie of the Year, Michael Carter-Williams, with the No. 11 pick when draft duds littered the top 10, and he came away with perhaps the best player in this past June’s draft, Joel Embiid, at No. 3. Throw in possibly the best player from the 2013 NBA draft (Nerlens Noel), the potential steal of this year’s edition (Dario Saric), and a couple more first-round selections in 2015, and Philadelphia seems to have a solid foundation for the future. Then again, we said that back in the 2011-12 season, too. Little of this helps the 76ers this season. Of Philly’s top-four scorers during a miserable 19-63 campaign in Brett Brown’s inaugural season as coach, Carter-Williams is the lone returnee. He’ll have one-time AAU teammate Noel at his side, although the former is recovering from offseason shoulder surgery and the latter hasn’t played a meaningful game since tearing an ACL as a college freshman on Feb. 12, 2013. Meanwhile, Embiid could miss anywhere from 2-5 months (or more), and Saric remains overseas for another two years. The rest of the roster is reflected in a fitting series of headshots on the team’s official website that features an NBA logo where Casper Ware’s face should be, a non-existent photo in Vasilije Micic’s stead, two players in suits and another nine still wearing the uniform of his former team. Ladies and gentlemen, your 2014-15 Philadelphia 76ers. Well, the Sixers watched one productive, versatile forward walk (Spencer Hawes) to the Clippers and dealt another (Thaddeus Young) to the Timberwolves for some $7.6 million worth of expiring contracts named Luc Mbah a Moute and Alexey Shved, so … no. At least not now. Mbah a Moute brings value as a mentor to fellow Cameroonian Embiid, and Philly picked up Miami’s first-round pick in the Young trade, but neither will have much impact this winter. Embiid, broken foot and all, is the attraction, even if he only tweets for his first few months as a pro. Four years into his competitive basketball career, the 7-footer averaged 17.5 points (65.5 TS%), 12.6 rebounds, 4.1 blocks and 2.2 assists per 36 minutes at the University of Kansas. That’s ridiculous, and if his game matures further in an NBA setting under Mbah a Moute’s guidance, the Cavaliers and Bucks may regret not acquiring him earlier, but first he’ll have to shed the injury-prone label. Where do we begin? The 76ers allowed a league-worst 109.9 points per game, and while Mbah a Moute and Noel bring solid defensive reputations, Young and Hawes took one third of the NBA’s worst scoring offense per 100 possessions with them. Philadelphia also did little to plug gaping holes on the wings, where Tony Wroten and Hollis Thompson are expected to once again receive extensive minutes. Wroten and Arnett Moultrie, a pair of late first-round picks in 2012, have bounced back and forth from the D-League in their young careers, and both have a chance to double their million-dollar salaries on team options next season or face their NBA mortalities before their 25th birthdays. Wroten enjoyed some success last season, particularly as a starter, averaging 17.8 points in that role, but his perimeter shooting (21.3 3P%) left plenty to be desired. And Moultrie’s rough year got rougher when he earned a five-game suspension for violating the league’s drug policy in March. 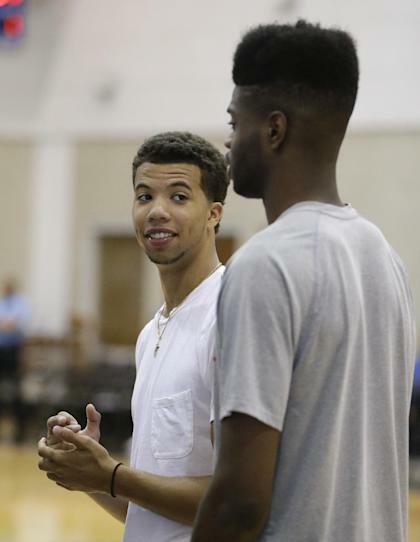 Both players provided reasons for optimism over the summer, as the 21-year-old Wroten dropped 53 points in his Seattle Pro-Am debut and the 6-foot-11 Moultrie showed up to camp in a slimmed-down frame. Ranked as the nation’s No. 1 recruit out of high school in the Class of 2012, the 6-foot-11 Noel earned SEC Rookie of the Year and Defensive Player of the Year honors despite missing the final month of his freshman season at the University of Kentucky. He’s long been considered an NBA ready defender, owning a shot-blocking prowess that carried a handful of ridiculous Bill Russell comparisons at the prep level, but it will be interesting to see how far his offense has come in 18 months of rehab, if at all. It won’t be long before he’s tested, since he’ll be starting opposite Roy Hibbert on opening night. A playoff run, however improbable it may be, would be disastrous for the Sixers, since their first-round pick would end up in Boston by way of Miami, so plummeting another tank to the NBA’s depths is the so-called best-case scenario, even if it’s not the most enjoyable (although some Philadelphia fans might take a twisted satisfaction in Tank 2: The Legend Continues — save for another 26-game losing streak). Meanwhile, the Philly faithful can root for Noel’s Rookie of the Year campaign, the encore to Carter-Williams’ ROY run and the healthy return of Embiid while keeping an eye on the LeBron James-less Heat, whose top-10 protected pick the 76ers received in dealing Young to Minnesota. Philadelphia will finish at 15-67, last in the Atlantic Division.